Where is Costa Rica, Costa Rica? 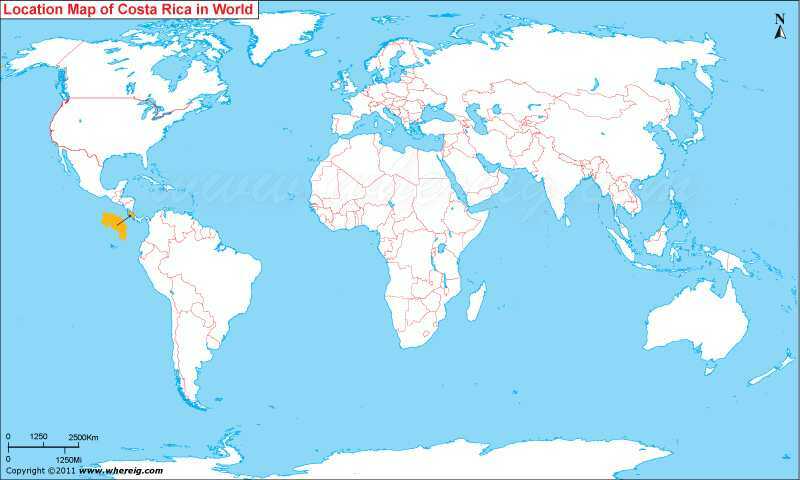 Where is Costa Rica located on the world map? The given Costa Rica location map shows that Costa Rica is located in Central America of North America continent. Costa Rica map also shows that it shares its boundaries with Nicaragua in the north and Panama in the east and south. Besides, country has coastlines from east side as well as from west side. The Pacific Ocean in the west and the Caribbean Sea in the east respectively limit the Costa Rica’s further extension. Since, it has large coastline from both sides therefore, its name is given Costa Rica because Costa Rica means Rich Coast. In comparison to other Latin American countries Costa Rica has high Human Development Index, ranked merely 62nd in the world in 2010. Surprisingly, Costa Rica is ranked 3rd in the world, and 1st in America, in terms of the 2010 Environmental Performance Index. In 2007, the Costa Rican government announced plans for the country that is to become the first carbon neutral country by 2021. The climate of Costa Rica is tropical with distinct features. The economy of Costa Rica is growing with the industrial development along with country’s infrastructure.